India suffered a heartbreaking 31-run loss to England on the fourth day of the opening Test at Edgbaston, Birmingham today. Skipper Virat Kohli's heroics went in vain amid yet another abject batting capitulation. It was virtually Kohli versus England.When the Indian captain was trapped lbw off Ben Stokes in the 47th over, the absorbing game was only heading the home team's way. Resuming on overnight 110 for five, India folded up for 162 in 54.2 overs despite Kohli's combative 51 off 93 balls and Hardik Pandya's 31. All-rounder Stokes who claimed 4 wickets, removed Kohli and Mohammad Shami in the same over. 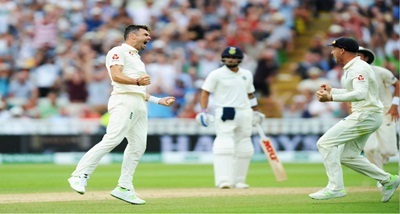 James Anderson and Stuart Broad claimed two wickets each as England drew first blood in what promises to be an engrossing five-match series. England skipper Joe Root was thrilled with the result. Virat Kohli acknowleged that Indian batsmen need to apply themselves better with the bat. He said it sets up the series nicely and gives us what we need to do going forward. Meanwhile, India fast bowler Ishant Sharma was today fined 15 per cent of his match fee. He was found guilty of animated celebration after dismissing England batsman Dawid Malan on day 3 of the Test. The second Test begins at Lord's on Thursday.